After a months-long investigation into the distribution of misbranded medications, adulterated legend drugs without a prescription and products containing mercury, federal agents supported by members of the Saint Paul Police Department and other agencies today (Wednesday, Oct. 10) executed a search warrant at the Hmong Village located at 1001 Johnson Parkway. The actions were taken after officials with the FDA received several documented reports of illnesses occurring as a result of these items being made available by businesses inside the market to community members. 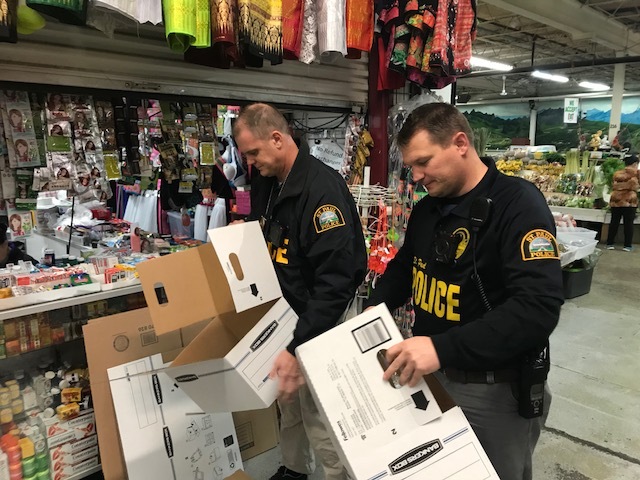 Investigators executed the search warrant in a thorough and respectful manner, focusing on vendors suspected of selling the products. The goal of the effort is to stop the distribution of illegal substances while minimizing any disruption to uninvolved vendors, such as those whose sole purpose is selling food. Business operations continued unaffected in the other areas of the Hmong Village during the warrant service. No arrests were made in relation to this search warrant, however several vendors were cited. The search warrant team was a multi-agency effort conducted by the Ramsey County Violent Crime Enforcement Team and the Federal Food and Drug Administration Office of Criminal Investigations, with additional personnel from the Saint Paul Police Department, the Ramsey County Sheriff’s Office, the U.S. Drug Enforcement Administration, the United States Postal Inspection Service, the Minnesota Board of Pharmacy, the Minnesota Pollution Control Agency, and the Saint Paul City Attorney’s Office. Information about the outcomes of this investigation will be available at later date.